POW-R WRAP+ - Pipe & Hose Repair Kit - 4" x 360" POW-R WRAP+ - Pipe & Hose Repair Kit - 4" x 360"
POW-R WRAP+ - Industrial Strength, Water Activated Fibreglass Tape, Pipe & Hose Repair Kit - 4" x 360" suitable for pipes up to 12"
= Clear plastic clamshell packaging with three color insert and instructions. 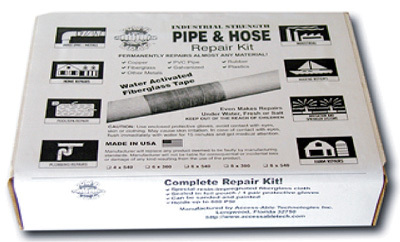 This water-activated, fiberglass tape permanently repairs almost any piping including plastic, copper, steel, galvanized, rubber and tile pipe. Will even work underwater! It contains no harmful solvents and is approved for use with potable water. Each package comes pre-mixed and pre-measured to insure a minimum of 8 complete wraps around a pipe (enough for high pressure applications up to 300 psi). 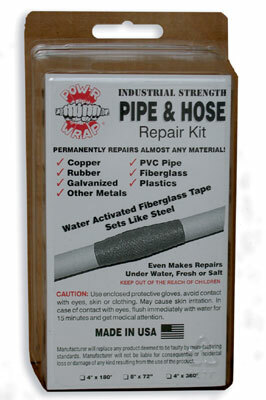 POW-R WRAP+ is an industrial strength pipe and hose repair kit. No tools needed ! Water activated fiberglass tape sets like steel. Repairs almost any surface permanently! Copper. Steel. Galvanized pipe. All plastic pipes. Rubber. Cement. Meets EPA requirements for drinking water. Strong and economical. Works on virtually every kind of pipe. An easy alternative to traditional methods such as cementing, soldering, welding, sleeving and replacement. Works on wet, dry, clean and dirty or corroded pipes. Even under water, fresh or salt!! Ready to use! Pre-mixed. Pre-measured. Cures in 30 minutes at 70ºF / 21ºC. POW-R WRAP+ is ideal for all fluid bearing pipes and hoses: Water. Steam. Air. Gas. Sewage. Fuel. Hydraulics. Recommended for structural repairs to brackets, fencing, support, exhausts& mufflers and tools. Contains no harmful solvents. 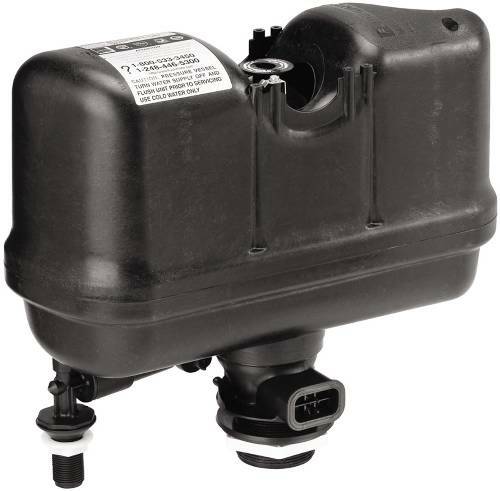 Can be used on water and food service lines. Chemically resistant to diesel fuel, petroleum products, halocarbon, and (after curing) alcohols. 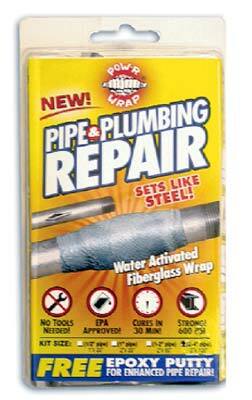 POW-R WRAP+ was developed as a simple, user-friendly method of repairing leaks and breaks in water lines. However, upon its introduction to the marketplace, many more uses for POW-R WRAP+ became apparent. The POW-R WRAP+ kit is now being used throughout the world in plants, factories, ships, schools, oil and gas companies, utility companies, lawn and garden maintenance businesses, hatcheries, wineries, farms and plantations. POW-R Wrap is solving such problems as corrosion prevention, gas line repair, insulation, encapsulation and the strengthening of all types of pipes and hoses. POW-R WRAP+ - Pipe & Hose Repair Kit - 2" x 60" POW-R WRAP+ - Pipe & Hose Repair Kit - 2" x 60"
POW-R WRAP+ - Industrial Strength, Water Activated Fibreglass Tape, Pipe & Hose Repair Kit - 2" x 60" suitable for pipes up to 1 1/2"
• Clear plastic clamshell packaging with full color insert and instructions. POW-R WRAP+ is an industrial strength pipe and hose repair kit. No tools needed ! Water activated fiberglass tape sets like steel. Repairs almost any surface permanently! Copper. Steel. Galvanized pipe. All plastic pipes. Rubber. Cement. Meets EPA requirements for drinking water. Strong and economical. Works on virtually every kind of pipe. An easy alternative to traditional methods such as cementing, soldering, welding, sleeving and replacement. Works on wet, dry, clean and dirty or corroded pipes. Even under water, fresh or salt!! Ready to use! Pre-mixed. Pre-measured. Cures in 30 minutes at 70+ F / 21+ C.
POW-R WRAP+ - Pipe & Hose Repair Kit - 3" x 108" POW-R WRAP+ - Pipe & Hose Repair Kit - 3" x 108"
POW-R WRAP+ - Industrial Strength, Water Activated Fibreglass Tape, Pipe & Hose Repair Kit - 3" x 108" suitable for pipes up to 3"
• Clear plastic clamshell packaging with three color insert and instructions. POW-R WRAP+ - Pipe & Hose Repair Kit - 4" x 180" POW-R WRAP+ - Pipe & Hose Repair Kit - 4" x 180"
POW-R WRAP+ - Industrial Strength, Water Activated Fibreglass Tape, Pipe & Hose Repair Kit - 4" x 180" suitable for pipes up to 5"
POW-R WRAP+ - Pipe & Hose Repair Kit - 2" x 30" POW-R WRAP+ - Pipe & Hose Repair Kit - 2" x 30"
POW-R WRAP+ - Industrial Strength, Water Activated Fibreglass Tape, Pipe & Hose Repair Kit - 2" x 30" suitable for pipes up to 3/4"
POW-R WRAP+ - Pipe & Hose Repair Kit - 1" x 30" POW-R WRAP+ - Pipe & Hose Repair Kit - 1" x 30"
POW-R WRAP+ - Industrial Strength, Water Activated Fibreglass Tape, Pipe & Hose Repair Kit - 1" x 30" suitable for pipes up to 1/2"
POW-R WRAP+ - Pipe & Hose Repair Kit - 8" x 540" POW-R WRAP+ - Pipe & Hose Repair Kit - 8" x 540"
POW-R WRAP+ - Industrial Strength, Water Activated Fibreglass Tape, Pipe & Hose Repair Kit - 8" x 540" suitable for pipes up to 20"
= Corrugated cardboard box packaging with three color insert and instructions. POW-R WRAP+ is an industrial strength pipe and hose repair kit. No tools needed ! Water activated fiberglass tape sets like steel. Repairs almost any surface permanently! Copper. Steel. Galvanized pipe. All plastic pipes. Rubber. Cement. Meets EPA requirements for drinking water. Strong and economical. Works on virtually every kind of pipe. 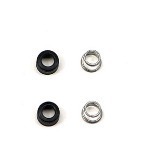 An easy alternative to traditional methods such as cementing, soldering, welding, sleeving and replacement. Works on wet, dry, clean and dirty or corroded pipes. Even under water, fresh or salt!! Ready to use! Pre-mixed. Pre-measured. Cures in 30 minutes at 70º F / 21º C.
POW-R WRAP+ - Pipe & Hose Repair Kit - 4" x 540" POW-R WRAP+ - Pipe & Hose Repair Kit - 4" x 540"
POW-R WRAP+ - Industrial Strength, Water Activated Fibreglass Tape, Pipe & Hose Repair Kit - 4" x 540" suitable for pipes up to 20"
POW-R WRAP+ - Pipe & Hose Repair Kit - 8" x 72" POW-R WRAP+ - Pipe & Hose Repair Kit - 8" x 72"
POW-R WRAP+ - Industrial Strength, Water Activated Fibreglass Tape, Pipe & Hose Repair Kit - 8" x 72" suitable for pipes up to 2 1/2"
POW-R WRAP+ - Pipe & Hose Repair Kit - 6" x 540" POW-R WRAP+ - Pipe & Hose Repair Kit - 6" x 540"
POW-R WRAP+ - Industrial Strength, Water Activated Fibreglass Tape, Pipe & Hose Repair Kit - 6" x 540" suitable for pipes up to 20"
POW-R WRAP+ - Pipe & Hose Repair Kit - 8" x 300" POW-R WRAP+ - Pipe & Hose Repair Kit - 8" x 300"
POW-R WRAP+ - Industrial Strength, Water Activated Fibreglass Tape, Pipe & Hose Repair Kit - 8" x 300" suitable for pipes up to 10"
For Kohler, K4404 tank and model M-101526-F3 with serial numbers; F3K, F3KR, F32. POW-R WRAP+ - Pipe & Hose Repair Kit - 2 - 1" x 30" POW-R WRAP+ - Pipe & Hose Repair Kit - 2 - 1" x 30"
POW-R WRAP+ - Industrial Strength, Water Activated Fibreglass Tape, Pipe & Hose Repair Kit - 2 - 1" x 30" suitable for pipes up to 1/2"
POW-R-PATCH - Pre-measured Repair Kit - 4" x 12" POW-R-PATCH - Pre-measured Repair Kit - 4" x 12"
POW-R-PATCH - Pre-measured Pipe & Hose Repair Kit - 4" x 12"
= Clear plastic clamshell packaging with full color insert and instructions. POW-R PATCH puts simplicity back into repairs with a No Mess, No Measuring, No Waiting ready for use kit. Each Simple-To-Use kit will set on wet surfaces, and will adhere to PVC, Metal, Wood, Fiberglass, Plastic etca and can be used on a broad spectrum of surfaces. 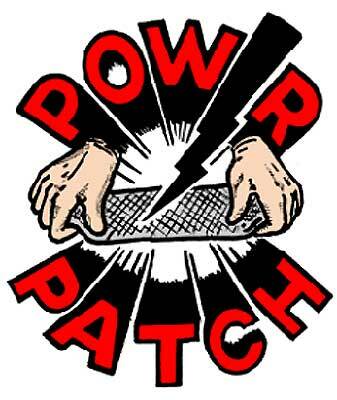 POW-R PATCH is perfect for fast repairs in farming, Industry, transportation, marine, plumbing, and irrigation as well as around the home. Common uses of the POW-R PATCH kit in the field are repair of overseas containers, chemical and fertilizer tanks, semi-trailers and roof repair, drums, pans and many other flat surfaces or open channeled containers. POW-R PATCH is a specially formulated, uniquely packaged, No Mess, pre-measured epoxy patch specifically designed for flat surfaces such as tanks, drums, pans and many other flat or open channeled containers. 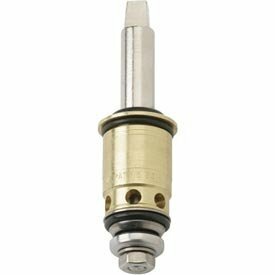 With a cure time of 5 minutes and pressure ratings of up to 3000 psi, this pre-measured component system is a simple, fast and convenient solution for what used to be a messy and difficult repair. The separated pre-measured components and pre-coated fiberglass cloth are combined in a self-contained package, assuring built-in accuracy. This simple-to-use product eliminates measuring, additional materials and eliminates the guesswork for maximum convenience and speed of repair. Mixing takes place within the package so there never any mess or clean up! 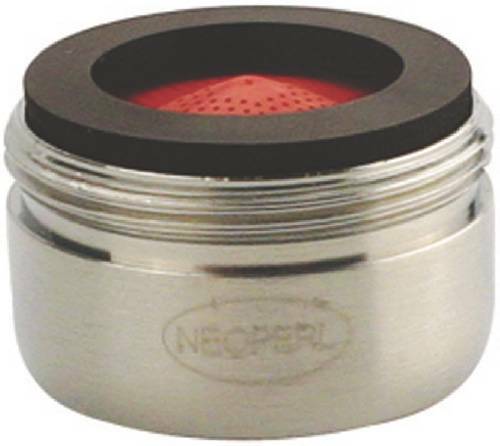 HOSE CONNECTION VACUUM BREAKER Prevents dangerous back-siphonage & backflow into potable water supply Attaches to standard 3/4" hose thread connection Provides a 3/4" hose thread outlet connection Protruding "tip" device for manual draining All brass construction w/threaded connections Breakaway set screw for tamper protection Listed by ASSE, CSA & IAPMO 171480000 3/4 VACUUM BREAKER SIZE:3/4"
Stop Cap For Plastic Guide. POW-R WRAP+ - Pipe & Hose Repair Kit - 6" x 300" POW-R WRAP+ - Pipe & Hose Repair Kit - 6" x 300"
POW-R WRAP+ - Industrial Strength, Water Activated Fibreglass Tape, Pipe & Hose Repair Kit - 6" x 300" suitable for pipes up to 10"
The Flip-It tub stopper replaces all types of stopper assemblies. 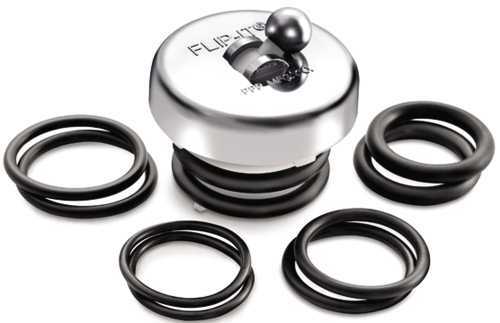 It contains a unique ball-shift toggle system that opens and closes drains with the simple push of a toe or finger.^^1-Piece Construction^This tub stopper is made from high-quality Delrin� or POM and ABS plastic. 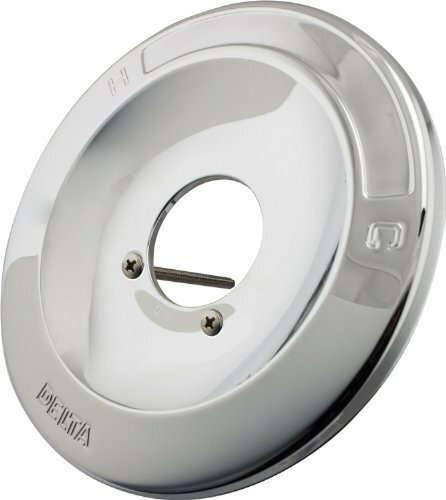 It also includes your choice of chrome-plated antique brass, PVD polished brass, or PVD brushed nickel for the finish.^^Simple to Install^You don't need tools to install this durable tub stopper. 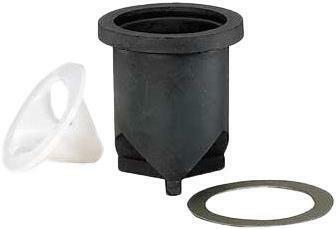 Simply affix its O-rings and press it into almost any drain. 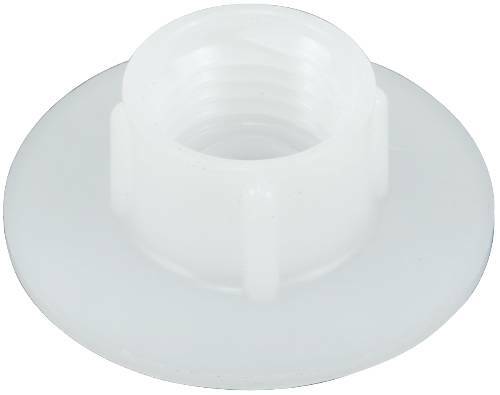 It fits 90% of all tub drain openings! For Gerber 28-385 tank, and model M-101526-F3 with serial numbers; F3GR, F33. POW-R-PATCH - Pre-measured Repair Kit - 4" x 6" POW-R-PATCH - Pre-measured Repair Kit - 4" x 6"
POW-R-PATCH - Pre-measured Pipe & Hose Repair Kit - 4" x 6"